Thanks to Pinterest, I came across the idea of bread with images in it when you slice it. I love the jack-o-lantern bread from Cake Student, but that seemed a little difficult for my first attempt. I decided to go with the simplest shape I could think of, a candy corn. Well, mine kind of turned out like a reverse candy corn, but you get the idea. I didn't change the ingredients, just the directions because I don't have a bread machine, and I had to shape of the dough differently. 1. In a large bowl or the bowl of your stand mixer, dissolve the sugar in the warm water, and then stir in yeast. 2. Mix the salt and vegetable oil into the yeast. 3. Mix in the flour one cup at a time. 4. Knead dough on a lightly floured surface until smooth, or use the dough hook of your stand mixer. 5. Place the dough in an oiled bowl, and turn the dough to coat it. Cover with damp cloth, and set in a warm place. Allow to rise until doubled in size, about 1 hour. 7. Spray a 9"x5" bread pan with cooking spray. 8. Separate dough into 4 balls of increasing size. 9. Leave the smallest ball white. Dye the next size up orange. Dye the second largest ball yellow. Mix the largest ball of dough with cocoa powder, until well combined (I needed to use my stand mixer to accomplish this). 11. Roll the cocoa dough out, like a pie crust, on a lightly floured surface. 12. 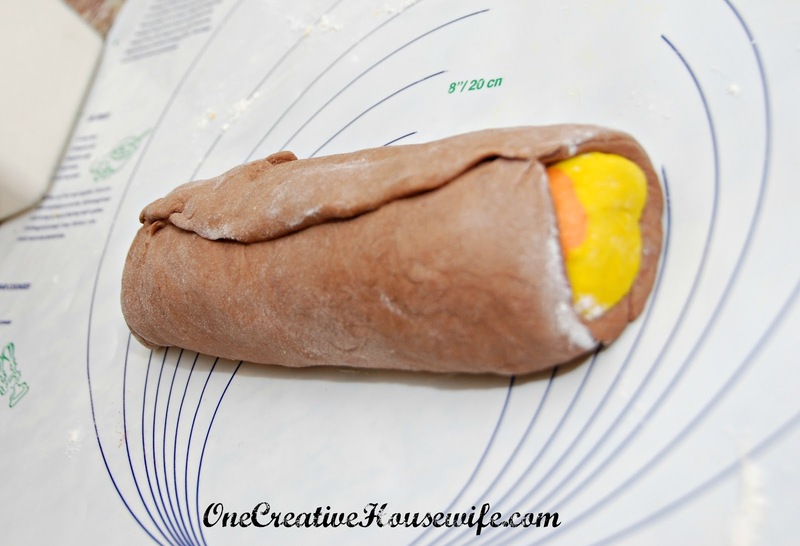 Wrap the candy corn shaped dough in the cocoa dough. 13. Place the dough log in the prepared pan. 14. Bake for 30-35 minutes. 15. Allow bread to cool in pan for 10-15 minutes, and then transfer to a wire rack to completely cool. The top of my loaf popped open, and for some reason the white dough rose more while baking than the others (I assume it is because I didn't have to work dye into it). 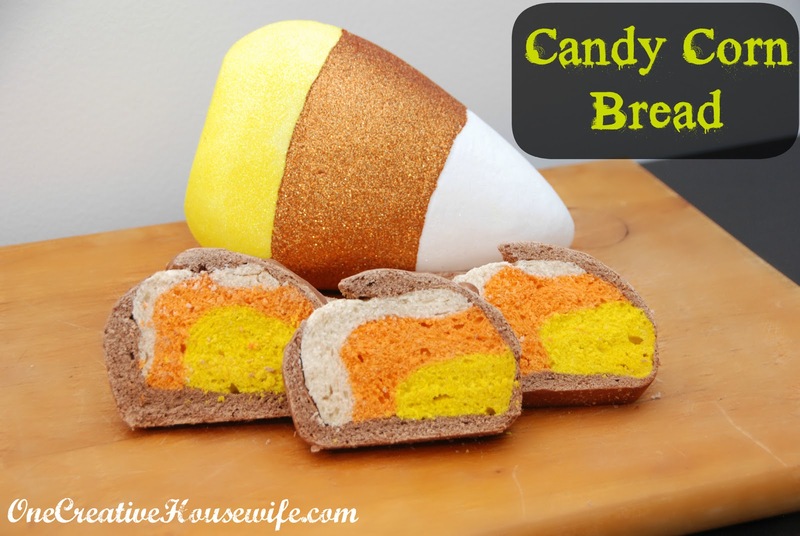 So my loaf doesn't look like a true candy corn, but my kids knew it looked like a candy corn without me telling them, and that is good enough for me. You are so creative! Another great recipe!! how cool! 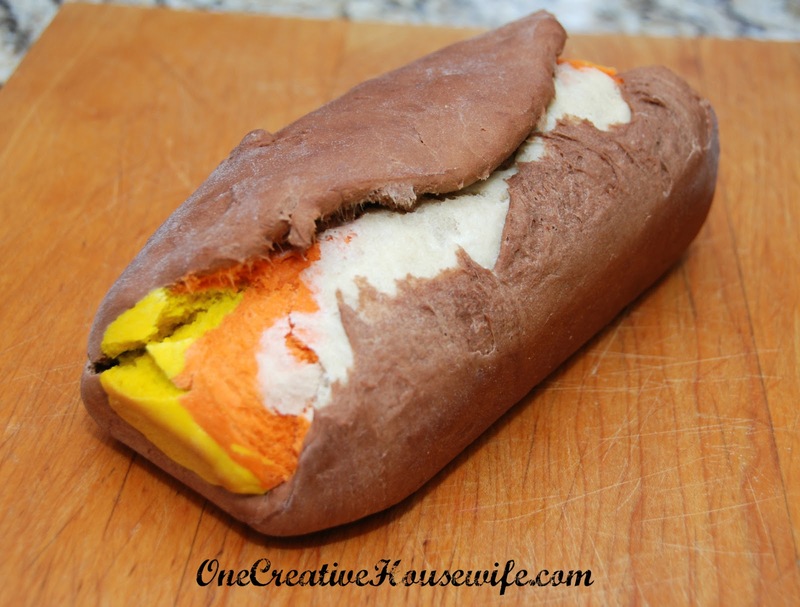 have you ever seen the panda bread? it's a similar practice, very cute!